The holistic approach to medical aesthetics views the skin as a whole – face, neck, and hands – handpicking the best available combined treatment from the wide variety present on the market today. “The goal is to give the face its best proportions while pinpointing the specific area that needs treating”. ***This interview is in collaboration with Dr. Lehavit Akerman and was originally published in Globes Magazine. What is the aesthetic holistic approach? Dr. Akerman explains that this is an integrative approach, the objective of which is to consider appearance as a whole and to develop a synergy between the wide range of capabilities and technologies available, all according to the special needs of each patient – all this in order to achieve optimal results. “The idea is to look at the face as a whole and to also include the neck and hands. For example, treating the face along with the neck or examining how adding volume to the cheeks will affect the facial area. Sometimes it’s a wrinkle that makes the face look older or sometimes it’s a blemish that affects the appearance and needs to be treated. 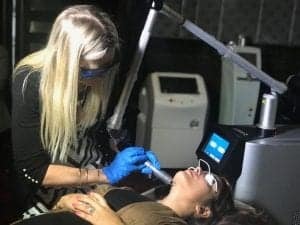 ” These holistic treatments combine all innovations in the field, including fillers, lasers, and various types of peelings, RF, ultrasound, creams and more. The guiding principle is to give the face its proper proportion and to pinpoint that specific area worth treating in order to achieve the desired look – natural on the one hand and young on the other. How is customization done among all existing technologies and products? “It all depends on the professional diagnosis performed by a dermatologist, with a thorough understanding of the structure of the skin, the healing properties of each area, skin types, sensitivities, genetic predispositions and more, in order to determine the appropriate tool and where active medical cosmetics should enter the picture. All this information helps build an effective and operational treatment program to be integrated into the patient’s life. This is not just a one-time episode but rather a treatment program.” Dr. Akerman explains, “It is important to remember that modern devices are powerful, and incorrect use or incompatible treatment may prove ineffective and even harm the patient. For example, pigmentation can be treated with a number of different means, but first, you have to identify the origin of the spots – whether they are hormonal spots or sun and age spots, and only then you can match the proper tool or a combination of procedures to conceal them. Can you give us an example of a combined treatment? The holistic approach goes hand in hand with the natural look. Dr. Akerman notes that today the tendency is to choose the authentic, non-manufactured appearance emphasizing the natural beauty inherent in each and every person through minimal aesthetic intervention. “My view of adapting the holistic approach is to achieve the right look and not necessarily the young look. The holistic approach supports the deployment of a modular treatment plan so that the change will not be visible all at once and dramatically, but rather gradually, so that the attractive look will be achieved slowly, such that it significantly improves the existing features, yet does not alter it completely. ” Moreover, timing is also important. According to Dr. Akerman, “It is important to carry out prevention and maintenance and not to wait for a serious situation, only then rushing to repair it. It is better to start early and to do minimal and preservative treatment each time – when age signs begin to appear – and to take care of the facial skin over time. ” Finally, she mentions that before the face is entrusted to a caregiver, it is important to make sure that he or she is familiar with all the advanced technologies and products in the market, and that the proposed solution is holistic, comprehensive and consistent with the patient’s wishes and budget rather than the agenda of any other party. Dr. Lehavit Akerman, an international expert in aesthetic skin medicine.